The Atlanta Business Chronicle reported that Georgia Power is about to launch a broad-based round of incentives to stimulate residential, commercial and public charging infrastructure development in its service areas. The reported $12 million program provides for a $250.00 rebate for consumers who install a level 2 EV charging system at their homes, and $500.00 for commercial properties who install a level 2 (AC 240v/40 amp) or $250.00 for level 1 (AC 110v/16 amp) charger at their workplace. Home and work are the top two places EV drivers want to charge up their vehicles. Additionally, Georgia Power is working with the City of Atlanta to support the creation of 50 public charging ‘islands’ where both level 2 and Fast Charge (DC 480v/100 amp) will be built to dramatically enhance the public availability of fast charging systems which will improve EV charging infrastructure in metro Atlanta and begin to build fast charge corridors to the outlying metro Atlanta areas including Athens, Newnan and Conyers GA.
Here’s the link to the Atlanta Business Chronicle’s breaking story: http://www.bizjournals.com/atlanta/blog/atlantech/2014/10/georgia-power-to-invest-12m-in-driving-electric.html. 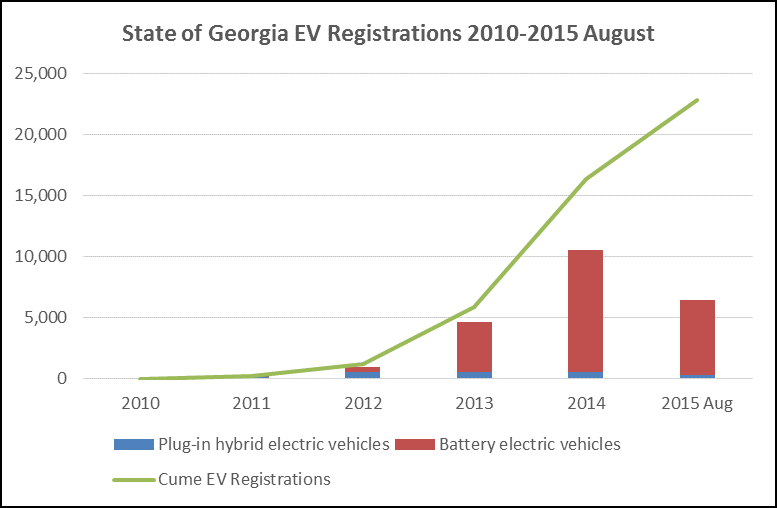 Georgia Power is no stranger to building electric vehicle infrastructure. In the early 1990s, Georgia Power installed over 500 level 2 charging stations in support of GM’s EV1 program when Atlanta was a test city. Some of those stations can still be found in and around Atlanta. CleanCitiesGeorgia Coordinator Don Francis, a 31 year veteran of Georgia Power, will help oversee this new program. Categories: Electric Vehicles, EV Charging Stations, EV Charging Stations, EV Tax Incentives, EVSE Providers, Home Charging Systems | Tags: #Atlanta, #electricvehicle, CleanCitiesGeorgia, Georgia Power | Permalink. Charging your electric vehicle at work in New Jersey just got a little easier thanks to a WorkPlace Charging program sponsored by PSEG. PSEG will provide up to 150 charging systems for free. Participating workplaces will need to install the units and pay for the electricity. PSEG will own the charging systems and collect usage data to better understand the impact of workplace charging on electric demand and the electric delivery system. The 13 employees in the program are estimated to have driven 120,000 miles on electric commuting to and from work in the first twelve months of the program. The participants are estimated to have saved 5,300 gallons of gas and avoided spending nearly $19,000 on gas just on their commute. By commuting on electric, it is estimated that the program helped avoid 50 to 60 tons of CO2 being released into the air as well as reduced particulate, SOx and NOx emissions in communities through the state. Workplace charging programs are pickingup steam across the US! Recently, the Department of Energy through the CleanCities program announced a $4.5 million funding program to encourage greater consumer engagement with alternative fuel vehicles. No doubt many of those pilot programs will focus on workplace charging. Georgia is expected to compete for funding given the very strong CleanCitiesGeorgia program under the leadership of Director Don Francis. Categories: Electric Vehicles, EV Charging Stations, EV Charging Stations, EV Sales Data, EV Tax Incentives, EVSE Providers | Tags: #Carbon #Emission, #electricvehicle, #sustainability, CleanCitiesGeorgia, Electric Vehicle, hybrid, PSEG | Permalink.